Known in the Philippines as Dama de Noche (Lady of the Night), the Cestrum nocturnum waxes paradoxical when grown in temperate areas. It thrives as a perennial plant in the warmer regions with no frost in the winter and actually tolerates cold temperatures outdoors. As you move farther north, however, it becomes a test of patience and tolerance. My Dama went into the TINZ, it is clear now, because I had no idea what these things were supposed to look like indoors in winter. In a word: pathetic. Not nearly alarming or desperate enough so that you will just toss it into the compost, but borderline is-it-dying-no-it's-sprouting-new-leaves-but-wilting-at-the-same-time-but-wait-it-looks-near-death-argh. Since I also grew up with this behemonth growing all over the place, I expected them to be as vigorous here in my office with the heat at 22C and humidity level at a constant 60 percent (more for my comfort than anything, really; the plants came into the scene because it seemed silly to maintain this habitat for just me).No such luck. C. nocturnum becomes leggy and wobbly as winter progresses, dropping its leaves at random and wanting a lot of water while also choking on it if you give it any.Throwing it into the pit would have been a no-brainer but whilst it is trying to die, you will also see it is very aggressively trying to grow as shiny new shoots appear at the tips.What to do, whattodo, watudu. It is entirely possible I just had a young plant but the chronic struggle was so irritating that in the spring, with temperatures still going down to about 5C, out it went into the ground, in a spot where it could be easily ignored. And look at it go! Left: Cestrum nocturnum planted in the ground in spring; Right: Same plant, early summer. From a leggy height of about 20 inches, it is now 36 inches tall; its growth checked only with constant pruning. 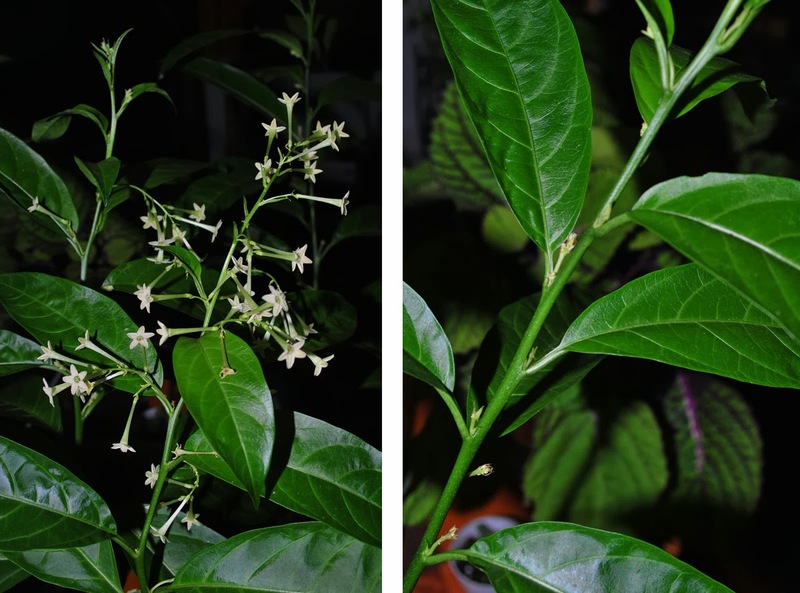 Throughout summer, Dama de Noche is fertilized only by run-off water from other potted plants around it. It got a lot of morning sun but starts to look pathetic around noon. By September, it started to bloom. The wafting smell is actually depressing if you are pining for the tropics. Otherwise, it's probably glorious. This plant has been consigned to winter death in that spot but its amazing performance during the summer earned it a reprieve. It has been dug up (in mid-bloom too), put in a huge pot with 4 parts gritty mix and two parts potting soil. This potting medium is significantly faster draining than its medium in the previous winter. Hopefully, that will be good enough to see it through its second winter. If it ever stops blooming, it will be pruned to a less hulking size and the cuttings will be rooted in the same pot. Live or die, it doesn't matter. It is still in the TINZ. Dama de Noche is extremely easy to propagate. If you are keeping it in the pot, you will soon find out that it grows quite fast when it is warm and you might have to trim your plant. Pay attention to the branches. If you want to root some cuttings, look for young branches and cut at the point just below where the stem turns slightly woody and kind of brown. I do this throughout winter in case the parent plant throws another tantrum and decides to die. 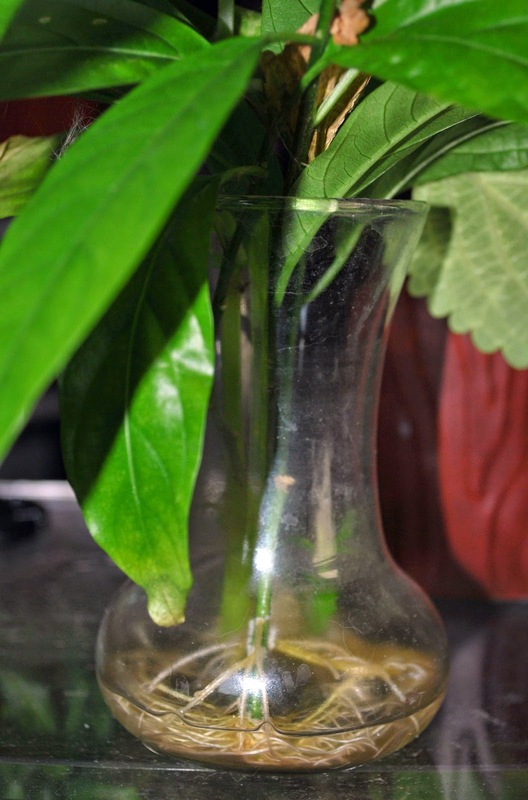 Remove the leaves to expose about 6 inches of bare stem and put it in a tall glass of water. Tap water is fine, the plant doesn't seem to care. Put it in a brightly-lit area, near a window, for example. The cuttings will root in a week or so but you should wait until the water roots have grown to several inches before potting it up. When the roots look like the ones in the photo on the left, it is ready to be potted. Because this plant tends to be leggy, it is a good idea (at least for visual purposes) to plant 3 to 4 rooted cuttings in a medium-sized 6-inc pots. This is a tropical plant, remember, so you want your potting soil to have the ability to retain water but it should also drain rapidly. To achieve this, use normal potting soil and add a third part of either pumice or perlite. A freshly-planted rooted cutting will be very thirsty as its water roots adjust to the soil so water the pot thoroughly. It will look miserable for a few days but once it recovers its sparkly look, you can put it in dappled sun and gradually move it to a spot where it will get full sun. Without a doubt, this plant behaves much better when planted in the ground, even in areas where summers do not get too hot. You know it needs water when it starts to look like it's about to pass out. The leaves droop and wrinkle from dehydration and will recover after being watered. This will not kill the plant but repeated dehydration is obviously not good for anyone so try to avoid it. If you live somewhere warm with no frost, definitely plant this thing outdoors where you can smell the flowers when it blooms. Remember that this plant grows into a humongous bushy thing that might need a trellis for support. In the tropics, it is often seen leaning against roofs or fences, in full sun. To keep it manageable, do not be afraid to trim it occasionally. It actually becomes bushier that way. And no, I have no idea what the fruits look like or how to sow the seeds. I've never seen either. 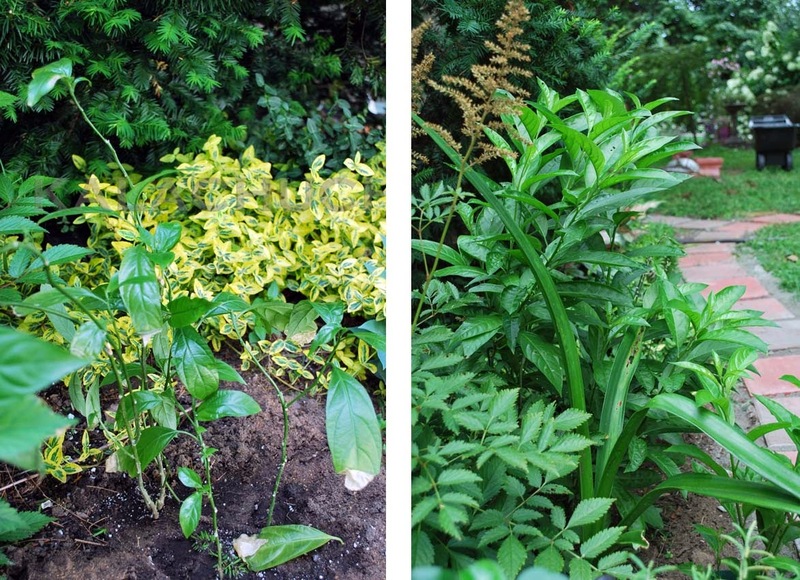 Fertilizing the potted plant, if you have it in the pot, is nothing special---use whatever fertilizer you use but apply it at half-strength every two months. In between, make sure you water it enough to drench the soil to avoid excessive build-up of various things the plant does not like. In the ground, you can be more liberal with your feeding. The 9-3-6 NPK formulation works best. Dama de Noche does not need those silly bloom-boosting 'roid fertilizers they tell you to use. It has its cycle and it knows what to take and how to store them for their bloom time. Unfortunately, this plant is salad to a lot of bugs, particularly several species of moths. When planted outside, however, you have better chances of just letting the surroundings take care of these pests. Caterpillars will be plucked out by birds and eggs will be eaten by whatever eats them. Indoors and in a pot, you need a bottle of horticultural oil to keep these pests at bay. You also should water occasionally with BT-treated water to kill bugs that lay eggs in the soil. If your neighbours have the habit of spraying their lawn with pesticides, herbicides and whatnot, the friendly, pest-controlling bugs will most likely be dead. Use fish emulsion. Pests hate it and it is a good foliar fertilizer as well. Consider the possibility of feeding birds to attract them to your yard. They will take care of caterpillars and grubs as well. Do not feed the birds early in the morning, let them clean your yard first. Feed them brunch instead. How often does it flower? Good question. Where you are, it will bloom as the weather cools down around the "'ber" months, if you have them in a pot. In the ground, though, they bloom around September, and then again around May, once they are established. In one cycle, you might get fresh sprigs of buds after the first batch starts to drop. Where I am, I consider myself lucky if they bloom at all. When they do bloom, though, I normally get three cycles starting around November just when autumn kicks in. But the last flush are less fragrant because by then, I would already have brought them indoors and they do not get as much sun as outside. Mine had one flower on in March and hasn't flowered since. Looks healthy apart from this though. Just leave it to rain to water. How do I make it flower though this is the question!!! I give mine orchid fertilizer when I remember it but even this is not a guarantee. They really need to be hot and in the sun, with a lot of water. This year we had some prolonged spring weather so mine is only just starting to develop buds. Usually, it'd be on its second flush this time of year.